Log Builder Caulking is a log home caulking sealant with a limited lifetime warranty by Sashco. Log Builder Caulking is designed to meet the demanding needs of the log home industry and is compatible with most construction materials. Log Builder is water resistant in 1-4 hours. Develops powerful adhesion, remains rubbery for many years (very resistant to weathering and ultraviolet light), and its water-based chemistry is environmentally friendly. 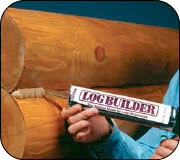 Log Builder Caulking is an excellent sealant for weatherizing your log home. Recommended for use with Backer rod Made in the USA.